The ITER assembly crane (top) is actually two 750-tonne cranes working in tandem. 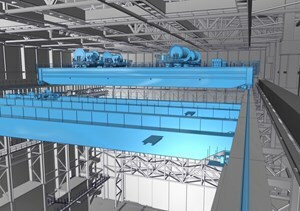 The system will be complemented by two smaller 50-tonne auxiliary cranes (bottom). If one excludes such monsters as the Taisun crane at the Yantai Raffles Shipyard, in Yantai China, capable of lifting 20,000 tonnes, the ITER assembly crane, with a lifting capacity of 1,500 tonnes, can be counted among the strongest in the world. The ITER assembly crane—actually two 750-tonne cranes working in tandem—will provide synchronized lift and millimetre-scale positioning for the ITER Tokamak components. 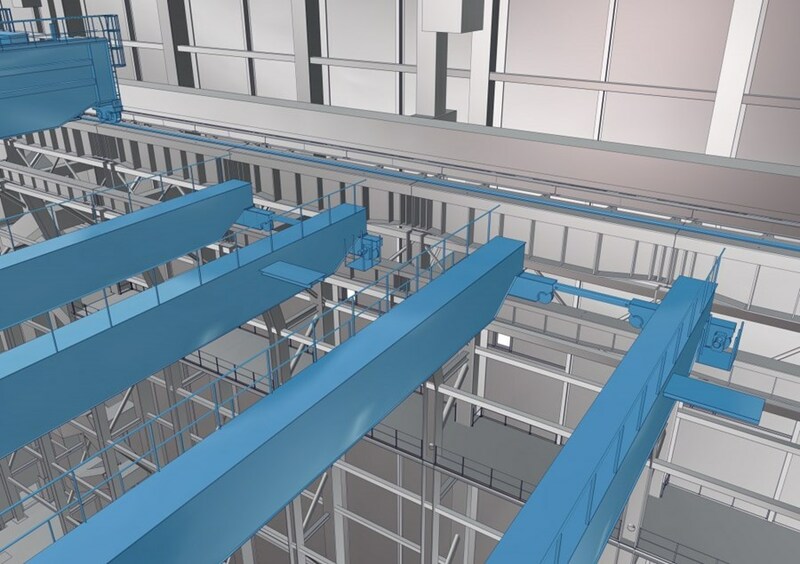 The system will be complemented by two smaller 50-tonne auxiliary cranes. In July, the European Domestic Agency Fusion for Energy awarded the contract for the design, certification, manufacturing, testing, installation and commissioning of the four cranes to a German-French consortium, NKMNOELL-REEL, formed by NKMNoell Special Cranes GmbH, Germany and REEL S.A.S., France. The contract, worth approximately EUR 31 million, also includes the 120-tonne capacity Tokamak cargo lift that will move activated components from the Tokamak to the Hot Cell facility during the Operation Phase. The Final Design Review for the assembly cranes, which started off at ITER on Monday 30 September with the presentation of the design, generated only minor comments. The design of the cranes must integrate the wider context, taking decommissioning requirements into consideration and also integrating the crane system into the structures of both the Assembly Building and the Tokamak Complex. 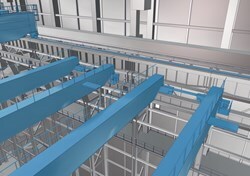 However the review, chaired by ITER's Central Engineering and Plant Directorate head Sergio Orlandi, strongly stressed the necessity of integrating the cranes in respect to the wider context—a "double" integration taking decommissioning requirements into consideration in the crane system design, and integrating the crane system into the structures of both the Assembly Building and the Tokamak Complex Building (two constructions that differ in almost all aspects). "Decommissioning the installation once the ITER scientific program is completed some thirty years from now is the responsibility of France," explains Sergio. "However, it is rational for the ITER Organization to design a system that will be used for both the assembling of the machine and for its dismantling. To me, integration for both phases is the key point. And this, as the design review pointed out, can be done with later minor refurbishing"
The assembly cranes will move along rails from the Assembly Building to the Tokamak Complex and back to position the components: the design review stressed the ''critical point'' of connexion between the two structures that must be addressed. The design review also addressed what Sergio calls "a critical point": the connexion between the Assembly Building and the Tokamak Complex whose combined length will be travelled by the cranes as they move from one building to the other to position the pre-assembled components of the ITER Tokamak. Central to the connexion challenge are the seismic joints that must allow for the progressive settlement of the 360,000-tonne Tokamak Complex. "After five or six years," explains Orlandi, "the building will have 'sunk' some 7 to 10 millimetres relatively to the Assembly Building which is much lighter. This is normal but it is something we have to take into consideration." We are still two years away from the beginning of assembly operations. "The crane is a very good crane. We have absolutely no worry about it. But integration has to get deep into our culture. Integration will insure that we have a safe and functional behaviour of the whole system in all conditions."